November 09, 2016, ©. Leeham Co: After my preparations at Bombardier (BBD) in Montreal, it was time to take an early flight to BBD’s test center in Wichita (KS) the next day. We spent the afternoon in briefings and went flying Wednesday. Figure 1. FTV8 (CS300) and FTV2 (CS100) at BBD test center. Source: Leeham Co. The trip to Wichita was with American Airlines regional carrier American Eagle on a BBD CRJ200. Within two days, I would experience the first and smallest regional jet, the CRJ200 (albeit in coach) and Bombardier’s latest and largest jet, CS300, which encroaches on the turf of the single aisles as a direct competitor to the Airbus A319 and Boeing 737-700/7. At the test center, just off the runway to Wichita International, I would be joined by Mike Gerzanics, who was test flying for FlightGlobal. We last met when we test flew the Airbus A350 in Toulouse in Spring 2015. At the BBD test center, we were greeted by the manager for the CSeries flight test group, Dan Chocron. The afternoon was spent with the test pilot, who would be in the right seat on the flight, Andy Litavniks. Time to review systems, avionics and engines and to ask any questions that we might have. Then dinner with the whole test group with many discussions around the history of the project and the background to the flight laws. 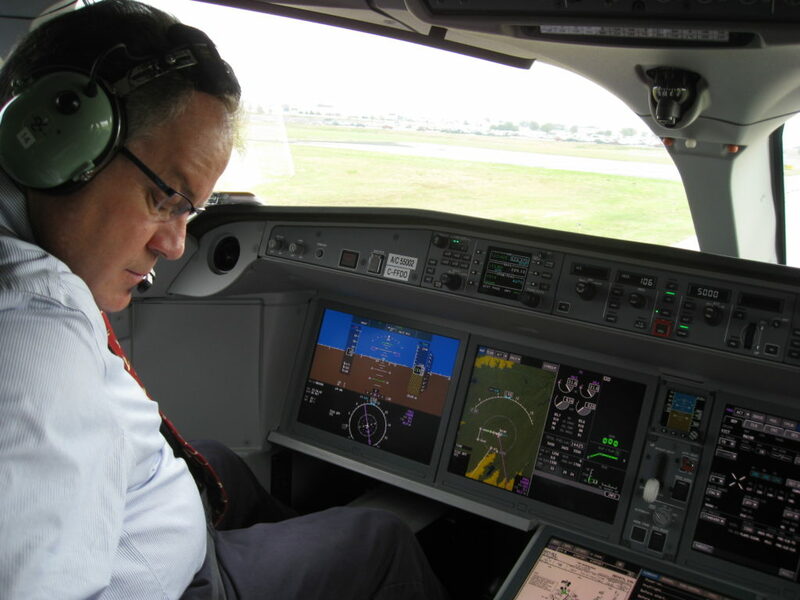 The CSeries Chief test pilot, Chuck Ellis, gave a good explanation for the background and discussions around the chosen flight laws and protection schemes. We described it in our article Preparing to fly the CSeries. Here in short: a pilot in trouble will find an aircraft which is behaving as he is used to since flight training. The aircraft will be nose heavy if it’s short of speed and pitching up if the speed is too high. The next morning, we all gathered for briefing before the test flight. The briefing was done in the usual manner before a test flight. The test engineer, Anthony Dunne, went through the test program. It contained flight phases for Mike and me but also test points that we should finish off before the aircraft, FTV8, would head out to the China airshow at Zhuhai, the day after our test flight. After the test program was discussed, the group’s technical crew went through the status of the aircraft, including status of all the essential systems. As it was a test aircraft, the software version for each major subsystem was marked, including any notes on the functionality status. 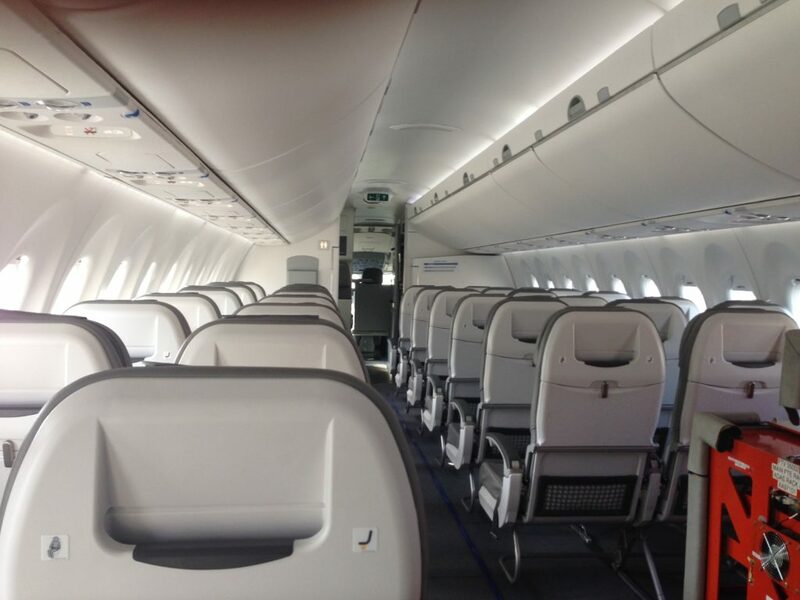 The test aircraft, FTV8, which is the second CS300 that has been produced, had a full cabin, Figure 2, except for two rows on the right-hand side where the flight test engineer is located (Figure 3). Figure 2. FTV8 is equipped with a cabin with standard seats with different row pitches. Source: Leeham Co. In Figure 2, the third cockpit seat, a clap seat, can be seen. Derek Thresher, one of the group’s test pilots, had his seat there as safety pilot for the test. Derek also shot the pictures and videos while we were flying. Figure 3. Anthony Dunne surveys the test flight progress from his test station. Source: Leeham Co.
After the briefing, we went to the aircraft on the flight line for preflight checks, Figure 1. There are no special precautions required in the preflight of the CS300. After entering the aircraft, Anthony and I sat down at the engineering station, Figure 3, with Mike, Andy and Derek preparing the flight up front, Figure 4. Figure 4. 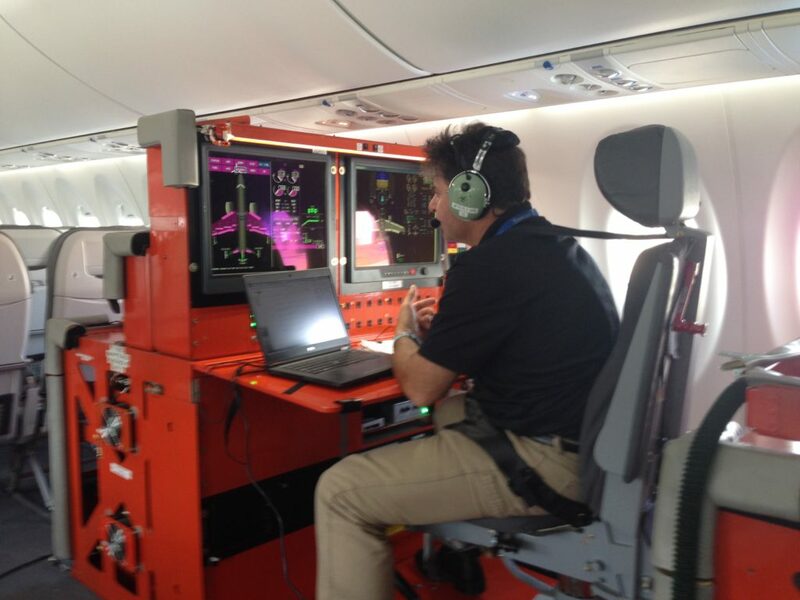 Mike Gerzanics getting strapped in for the CS300 test flight. Source: Leeham Co. The electronic checklists are refreshingly minimalist, as I discovered in the simulator. We were soon ready for engine start. This is done with a simple push of the engine switch to “Start.” Everything else is automatic. Time for taxi. Steering is with a tiller beside the side-stick. On the runway, the pedals also command nose wheel steering. After some waiting for landing aircraft, Mike lined up on RWY19 on Wichita International, for right turn out to our practice area West of the airfield. Takeoff was brisk. We were light at 84,754lbm Zero Fuel Weight (ZFW) and 15,000lb of fuel. After some initial air work for Mike, it was time for me to take the captain’s seat, Figure 5. Figure 5. Strapped into the captain’s seat for initial air work to get the feel of the aircraft. Source: Leeham Co.
After some initial normal flying, where I could check out the “trim for speed” pitch laws, we checked out the protection schemes. It commenced with deep turns with up to 60° bank and then we focused on the pitch laws and protections. The video clips in Figure 6 describes best what we did. First we shut the throttles, extended Flaps 4 and put the gear down. Then I pitched the aircraft to come to the yellow warning on the speed take for “soft stop” at 100 kts. 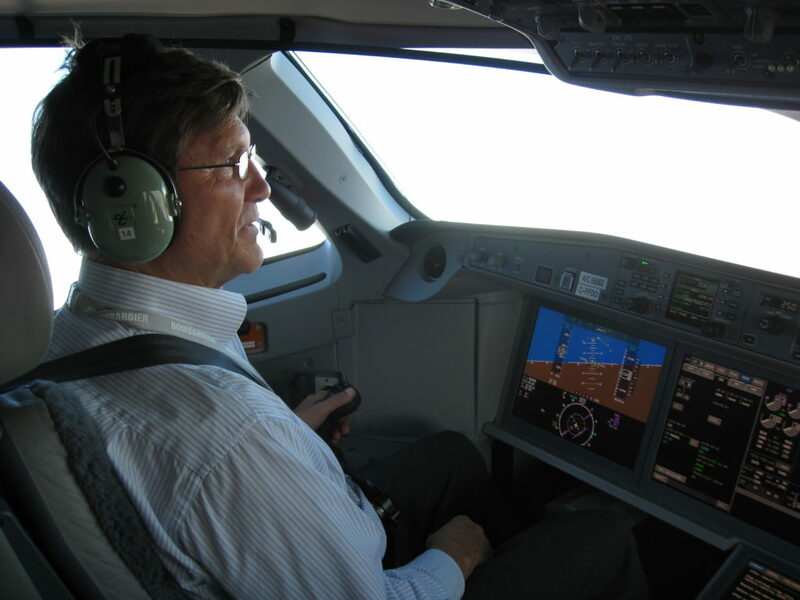 Then I pulled the side-stick to the hard stop which decelerated us to 95kts. It required quite some extra force (which is as it should be). Figure 6. Video clip of me trying out the protections schemes of the CS300. Source: Leeham Co. The protection region from soft-to-hard stop will take the aircraft outside the normal flight envelope and can for a high-speed case exceed the normal operation load factor for the aircraft. It allows the load factor to reach 2.75G with the soft limit at 2.5G. After having passed 2.5G, the aircraft must pass a structural inspection before being allowed to continue flying. The inclusion of hard limits in the possible flight envelope makes sense. If things turn really bad, a structural inspection is a light price to pay for an aircraft which maneuver out of trouble. The hard limits will keep the aircraft inside its structural limits (the so- called ultimate load limits), but traverse the limits of the normal flight envelope. Everything was totally uneventful. The maneuverability of the aircraft was good. After the limit tests, we did a simulated normal approach followed by a go-around where Andy pulled my right engine. The aircraft yaws into the stopped engine to let the pilot know that an engine is not pulling. The yaw indication on the PFD (Primary Flight Display) changes to Beta index instead of Yaw degree during One Engine Inoperative (OEI) flight. Beta index Zero gives lowest drag for an engine out situation. It was easy to hold the correct side rudder to get the index to Zero and keep it there. One can choose to trim out the pedal force. I prefer to keep the pedal pressure; it alleviates the trimming during the OEI approach that followed. It was straight-forward to fly the aircraft on one engine during climb, circuit and approach for landing. Once finished with the OEI stuff, it was time for Mike to strap in and go home for his approach and OEI circuit. The flight went as planned and we could check the test points that the technical team had asked us to do. Figure 7 shows Andy after the flight. He seems happy that we did not bend the aircraft the day before it was to fly to Hawaii and then China for the Zhuhai Air Show. Figure 7. Andy Litavniks in FTV8 cockpit after completed test flight. Source: Leeham Co.
After parking the aircraft (Figure 8), we entered the briefing room for flight de-brief and lunch. Figure 8. FTV8 after our flight test. Ground crew will now prepare it for flight to China. 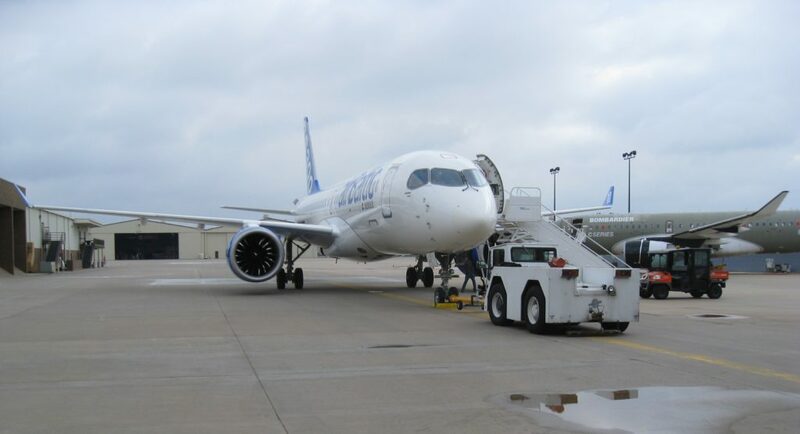 Source: Leeham Co.
Bombardier CSeries is the only modern clean sheet aircraft in the 100 to 150 seat range. That it is a new design is evident when one test flies the aircraft. The cockpit is modern with large and easy-to-read displays. The number of knobs and controls are at a minimum, all very clear in their function and handling. The whole overhead panel has a “dark and knobs in 12 o’clock” as a “normal operation” philosophy. Checklists are minimalist and logical. The Nav displays are graphical where Nav points can be injected via point and click. The FMS is tiles and tabs divided into phases of flight. Finally, the flight laws and protection schemes are modern and makes sense. I’ve said it before. There are few (if any) areas where I would have chosen a different path than the CSeries team did in the aircraft’s design. This includes how the aircraft flies. Apparently a boring to fly aircraft. And that’s a compliment! As you tested the hard limits, was the the aircraft submitted to a structural inspection before its following flight to the China airshow at Zhuhai? We tested at a low enough speed, around 100kts (actually the lowest possible with Flaps 4, we could also have gone Flaps 5 and gained a few knots more) so that there was no appreciable load on the aircraft. So no inspection needed. That is also the reason why you do the check out on the low end but it’s also the more interesting one as you are close to stall and you want to see if the aircraft runs out of lateral control (it did not). Andy also let me give full throttle which is even more stressful for overall control, still full control-ability of the aircraft. At high speed you only feel the G load but the aircraft flies rock steady, it’s just a high stress situation for the aircraft. As a pilot it’s trivial and therefore no check point. Sad. These state-of-the-art airplanes have sucked every last drop of fun out of the cockpit. Minimalist knobs and switches? Giant Windows Desktop screensavers that let you cheat with synthetic vision so you can let your IFR skills rust away? Fully-automated engine start? Minimalist checklists? Quiet engines? These should be negatives to a proper pilot. It’s like pilots these days just want to get paid to sit and have no passion, can’t be bothered to operate the airplane. In a time when we are approaching pilotless airliners, i think we should appreciate the job while it exists, and not rave over the ushering in of more and more automation. Every new bit of automation is one less reason for you to be in that cockpit. Keep that in mind.